Are you aware that you experience sensations because of a small portion of your brain called the hypothalamus? 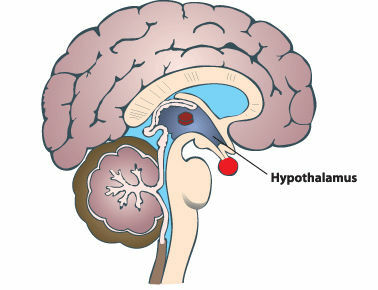 The hypothalamus recognizes the different stimuli coming from the various parts of the body. Only when the hypothalamus recognizes them do we feel sexual pleasure, rage, fear, and other emotions. This is why when we are unconscious, we fail to feel any of these sensations. The hypothalamus, with its small nuclei and with the help of the funnel-like infundibulum, is responsible in controlling the secretion of several hormones which perform important physiological functions in the body. Here are major hormones secreted by the hypothalamus. CRF is responsible for the secretion of the Adrenocorticotropic Hormone or ACTH which, in turn, is responsible for the control of secretion of cortisol in the adrenal cortex. This cascade reaction only occurs when all of the endocrine organs are functioning normally. GHRF is responsible in the control and release of Growth Hormone or GH in the anterior pituitary. Growth hormone is responsible for the growth and development of all cells and tissues in the body. GnRF controls the release and secretion of gonadal hormones produced by the female and male gonads or reproductive organs. Without GnHRF, the secondary female and male sexual characteristics will not develop fully. TRF stimulates the anterior pituitary to secrete Thyroid Stimulating Hormone or TSH. TSH, in turn, is responsible for controlling the secretion of the thyroid hormones in the thyroid glands. The thyroid hormones; namely, thyroxine, T4 or triiodothyronine, and T3 are the major metabolic hormones of the body. They help metabolize major foodstuffs in the body like carbohydrates, lipids and proteins. These major hormones secreted by the hypothalamus help maintain homoeostasis or the intricate state of balance in the body. Homeostasis allows our bodies to heal themselves and perform their functions properly.